A beautiful side effect to our lifestyle is when we find ourselves with a few weeks (or months) without plans. It really helps us slow down and live in the moment because we can ask ourselves what we want to do right now. 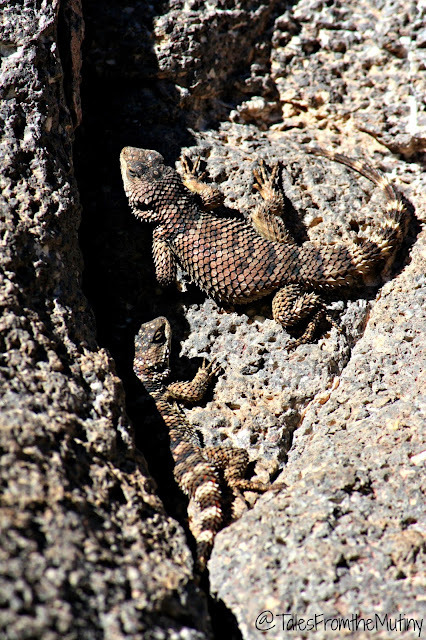 So, while we did have reservations to meet some fellow nomads in Tucson at the end of February, we had almost a month of unscripted time to fill. We pulled out the ol’ atlas and tried to figure out where to go. 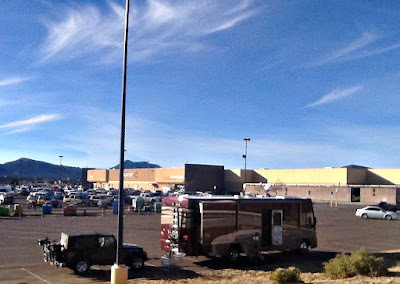 Our very first Walmart overnighter…Silver City. 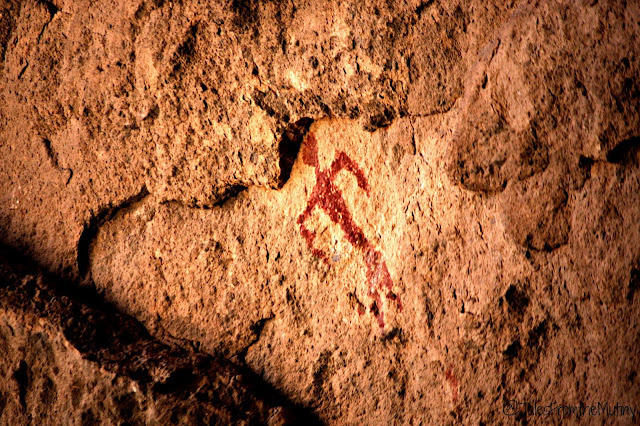 Having recently read Animal Dreams by Barbara Kingsolver (thanks Jeanette of JenEric Ramblings), I got the idea that we should head east into New Mexico. A few minutes hours of Googling and I’d figured out that we could not only visit the Gila Cliff Dwellings National Monument but we could hit up the ever popular City of Rocks State Park, making our trip a nice little loop with little back tracking. It also gave us the chance to experience our first ever overnighter at…Walmart! Yep, two and a half years on the road (as of this specific stop) and we’d never stayed at in a Walmart parking lot. Since we were eager to get back off-the-grid and into the wilderness, away from cities and towns, we only spent the night in Silver City (at the Walmart) where we stocked up on groceries for the week. The next morning we headed up into the mountains and found the small, USFS campground, recommended on WheelingIt’s blog, named Mesa. We had the entire campground to ourselves. And it was gorgeous. And treed. And a little rainy. So, we “splurged” the $15 for an electric site since our solar was not going to cut it (America the Beautiful Interagency Senior and Golden Access Pass holders pay half price). 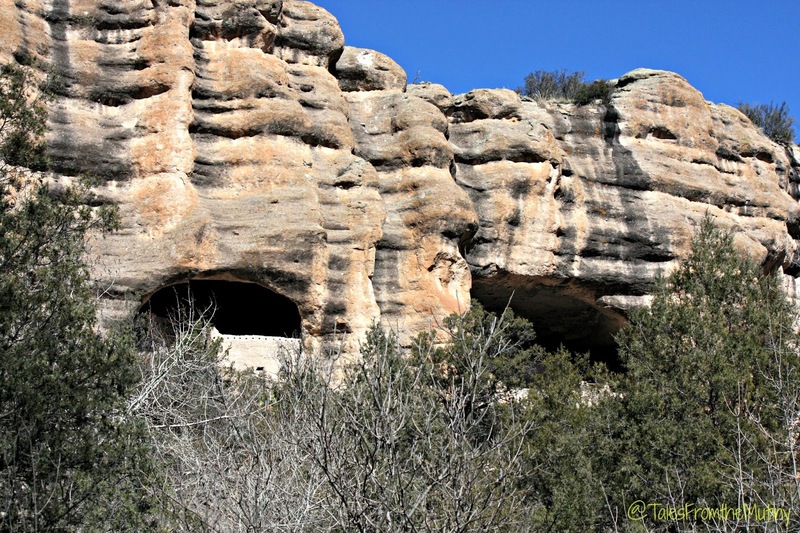 Mesa Campground is about 25 miles from Gila Cliff Dwellings which, on the winding mountain roads, translates to a 40 minute drive (one way). Needless to say, we only drove there once. Along the way we spotted quite a few great camping spots that would be suitable for even our size rig except for the mud. Visiting early in the season meant we were dealing with a little rain and swollen rivers. Some of these spots offered amazing backdrops of the rocks and Gila River and would be well worth the drive for such prime scenery (once the ground dries up). 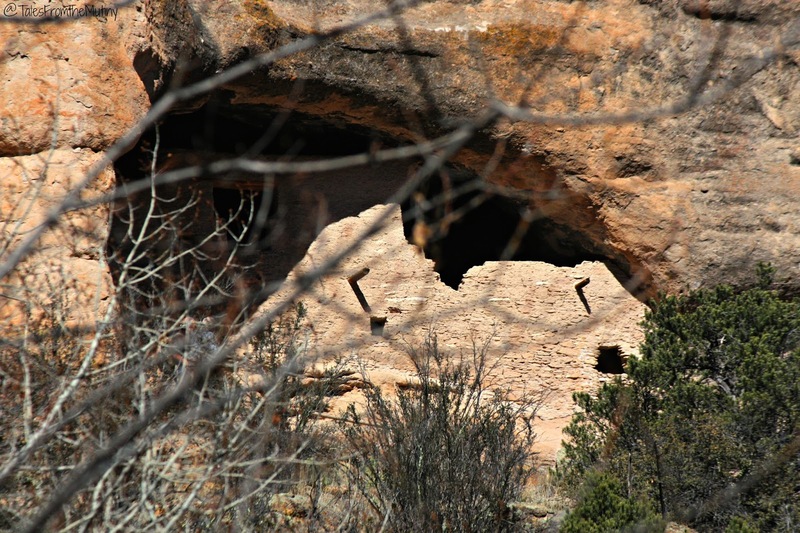 Even though we’ve seen some spectacular examples of cliff houses in Mesa Verde and Chaco Canyon, the Gila Cliff Dwellings were a fun visit. 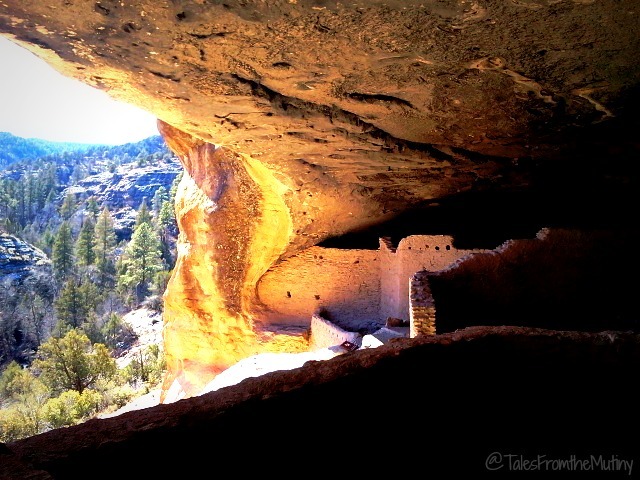 There’s a short hike to get access to them…one that has a few stairs and can be slippery…so be prepared. We had to stop and help a senior, who had slipped and fallen several times, back down the trail to the ranger station. It’s very doable for most people but, unfortunately, does not appear to be handicapped accessible at this time. We rolled up our pants and traversed the river. After touring the dwellings I got a wild hair to go hike to one of the many hot springs in the area. The shortest hot springs hike is Light Feather. It’s only about 2 miles but requires 2 river crossings (one way). I kinda didn’t realize that when we headed out with our lunch stuffed in the backpacks. But, about a half mile into it we noticed the first set of cairns…one of this side of the river and one on the other side of the river. Not one to back away from a challenge Clark grabbed a stick and poked his way across to the other side. I followed, my toes turning blue from the snow melt water almost immediately. 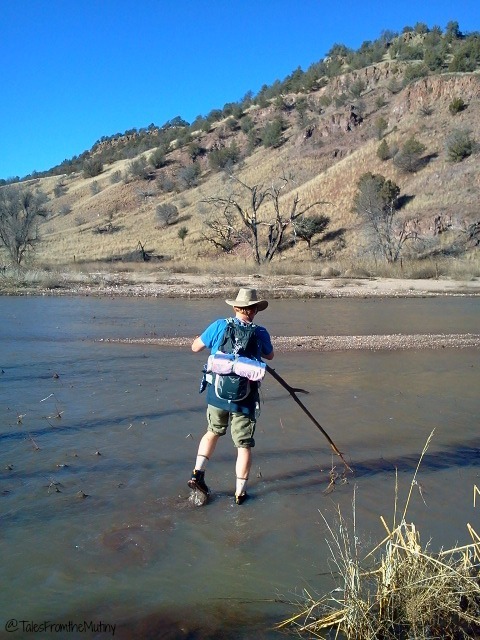 Just as soon as my feet thawed out and feeling came back into my toes we had another river crossing. And this one was even wider. Oh yay! 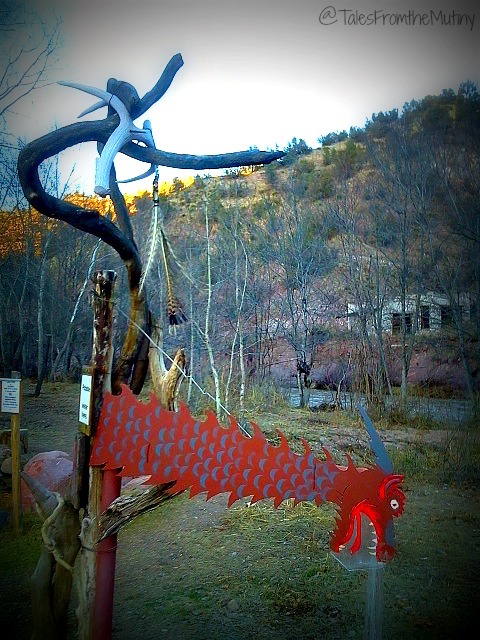 All I could hope was that the hot springs would restore feeling in my body and soul once we found it. But, as luck would have it, what we found was that the river was too high for us to block off the hot water flow into a pool. 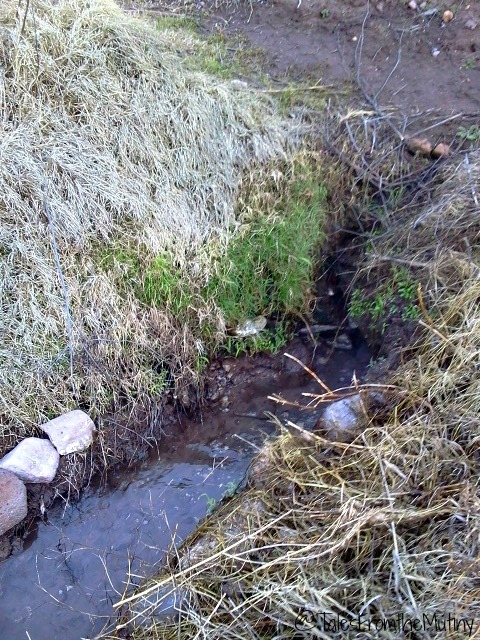 Apparently, the hot spring is a small trickle of 130 degree water that meets the Gila River. In order to be able to soak you have to pile up some river rocks and dam up the hot water while allowing just enough cold water in so you don’t cook your own skin off. Here’s a little video showing where the hot springs meets the river. Unfortunately, it appears the sound on my phone didn’t work but you can see the size of the river versus the input of the spring. Dejected and with water logged feet we found a tiny bit of sunshine to sit in to eat our lunch before making the hike back. And yes, that meant crossing the river again…two more times. The walls of the canyon are far to steep to attempt this hike any other way. It may have been that Clark mentioned my lack of planning several times back to the Jeep. I had to do something to save face and to warm back up. The dragon spits fire water! One of the pools available for dipping. Our favorite pool had a little rock island in the middle (a nice spot to hold your drinks). The answer came on the ride back to the campground. 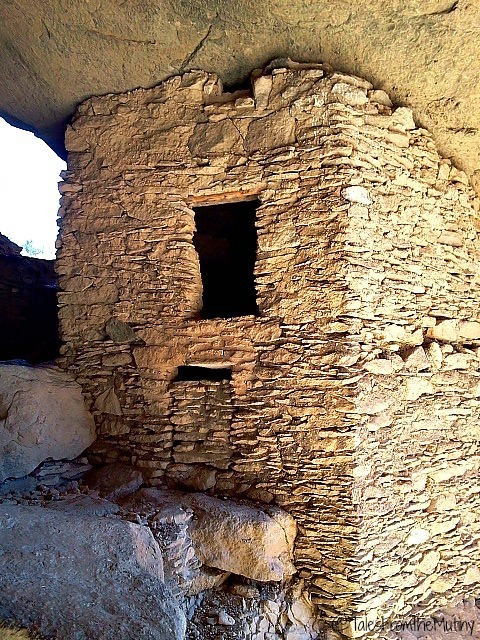 We had passed a commercial hot springs somewhere between the Cliff Dwellings and Mesa Campground. We spotted the sign, drove through what appeared to be someone’s private sheep farm, and parked next to three developed, but natural, hot spring pools. For $5 per person we were able to soak to our hearts content. The pools overlook the river and giant cliffs. Glorious…and well deserved. We were told by a local that after the dark (when the kids go to bed) the pools become clothing optional. 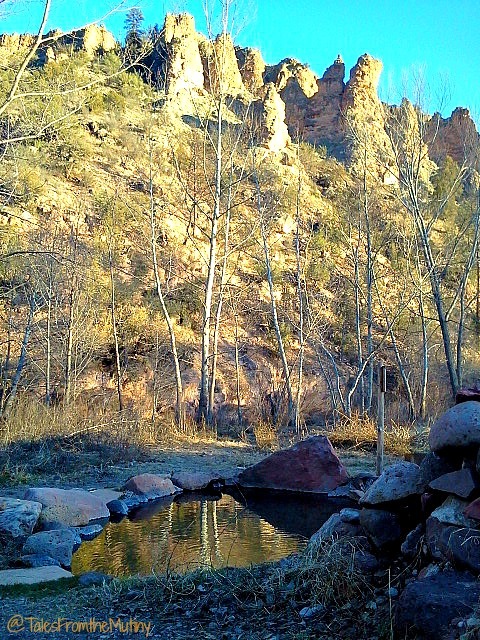 Check out Gila Hot Springs Campground for information on these pools as well as dry camping. For an inexpensive RV park with hookups check out Gila Hot Springs Ranch. Since the weather was a little rainy and foggy most days we only hiked one trail near Mesa Campground (if you don’t count hiking around part of the lake it overlooks). 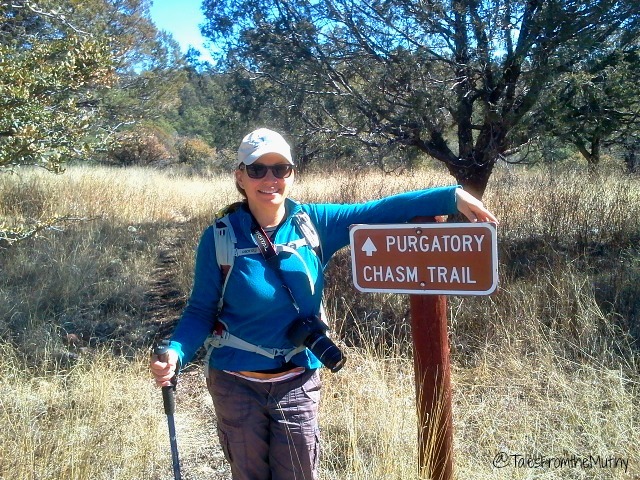 Purgatory Chasm Trail is a short 1.6 mile loop that takes you to a narrow canyon section. Lots of opportunity to climb around is it’s not too wet and a great spot for a picnic lunch. The trail is also dog friendly and not too difficult. We really enjoyed it and you probably will too! Important travel tip: Highway 15 is not suitable for vehicles over 22 feet. We took the Jeep on it for a couple of miles and I, personally, wouldn’t take a vehicle over 8 feet on it. It’s winding and narrow…sometimes just a single lane. Highway 35 is the one suitable for RV’s and 5th Wheels.